​Ford's Master Parts Catalog is a god-send when working on these trucks. But, it can be somewhat obtuse when trying to find parts for a carburetor. That's because Ford used carb's that were specifically tuned for that particular vehicle, and for many of the parts you need to know the specifics about that carb. 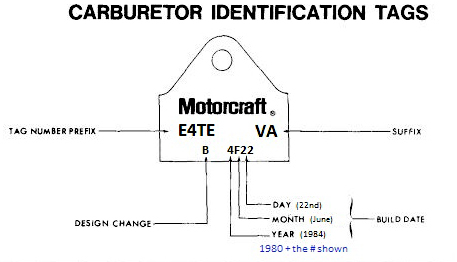 The easy way is from the information on the ID tag that was originally on the carb, like the one shown here. (Hint: Click on it to enlarge it.) However, by now most of the tags are gone. So, you may have to look for a stamping on the body of the carb to find the # - although many carbs have been replaced with a remanufactured carb that may not have the same identification number. But, there is still a way to find the parts. Let's take an example of a 1984 2wd F150 w/a 300 six, manual transmission, and under 4000' emissions. And we will find the information for the carb two different ways - with and without the carb's tag. Finding the Info With Tag: First, assume we got lucky and the carb has a tag on it that says "E4TE VA", and below that "B 4F22". Decoding the latter information using the decoder ring to the right and above, the carb is a "B" series, meaning it has some modifications vs an "A" series. And it was built on June 22nd of 1984 - apparently a late 1984 truck. As for the E4TE VA, we can go to the catalog's Carburetor Identification Chart, which is Section 95 in the Text Section (page 1858) of the catalog and find your carb's part number. (Note that Ford adds a "-" between the E4TE and the VA in this section of the catalog, so if you search you'll need to search for "E4TE-VA".) Sure enough, on Page 16 of Section 95 we find the entry we are looking for, as shown to the right. However, the bit we really need is the "Parts List 95." information. In this case it is "1AT" and coupled with the header we get "Parts List Number 95.1 AT". And we will use that information below, so you can now skip to the Parts List discussion since you have the parts list info. 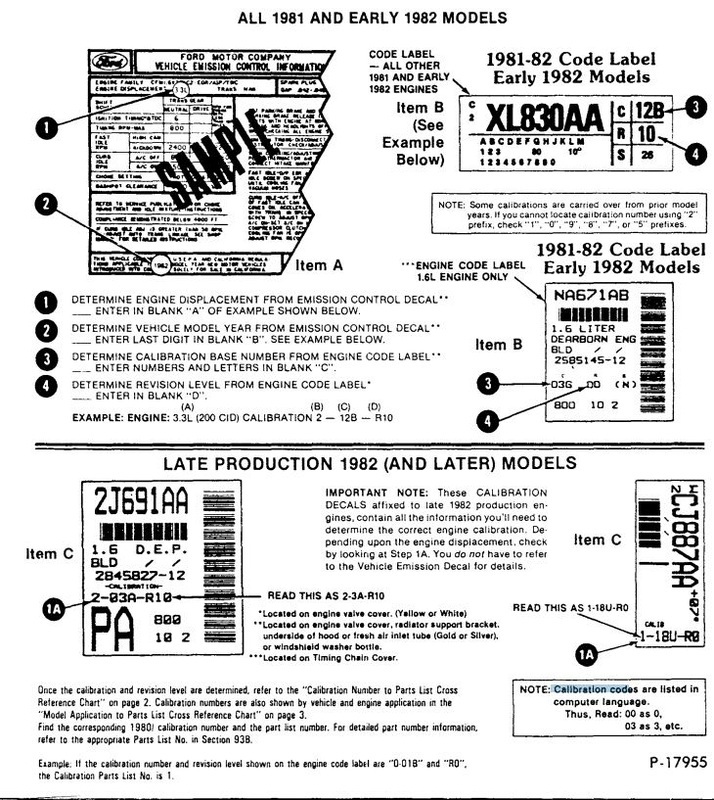 Each vehicle left the factory with a sticker giving the calibration code, and Ford's explanation of where to find it is in the image to the right - click it to make it bigger. If you can find the calibration code on your truck, skip ahead to Using The Calibration Code. Calibration Code: Search for "Calibration No. 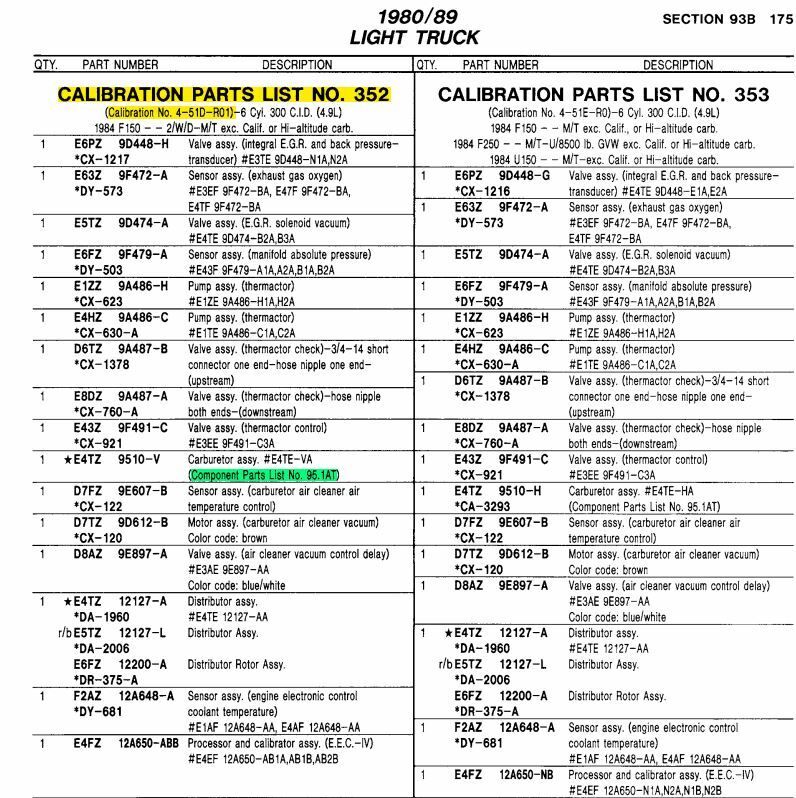 X" where X is a calibration code like "4-51D-R0D"
Parts List #: Search for "CALIBRATION PARTS LIST NO. X" where X is the parts list number for the carb in question. That gives you numbers to every part that is specific to that calibration code. In the shot on the right you can see that Calibration No. 4-51D-R01 is also Parts List No. 352, so you could get to it either way. But the holy grail in this is what is highlighted in green: Component Parts List No. 95.1AT. As it turns out, parts list #'s 352 through 355 all point to 95.1AT, so we don't need to worry which of those 4 #'s is correct for our example. So, take "95.1AT" to Parts List discussion, below. So, for the example we have been using we'll go to Section 95.1 for the Carter. 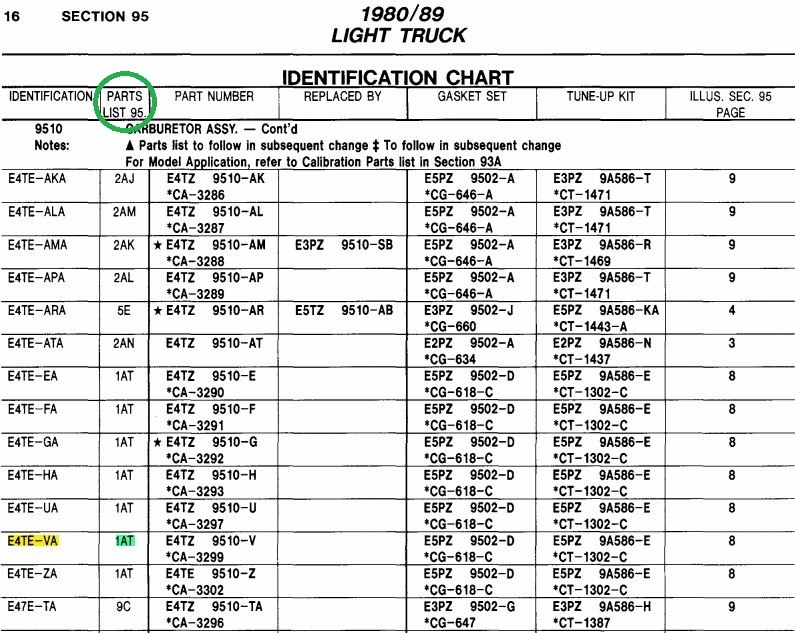 Notice that I have "Section 95.1" circled in green, and "Carb Parts Lists 1A thru 1M" circled in red. What that means is that this page covers carbs with parts list #'s 95.1A through 95.1M, with carb 95.1A using anything that shows in its column, 95.1B its column, etc. And there are usually several pages showing the parts for that carb. ​But our example uses parts list # 95.1AT, and that starts on Page 1906. For instructional purposes I'll include all of the pages for that particular carb so you can see what information is available. And, that allows me to point out something that confuses me from time to time - that there are sometimes multiple parts seemingly indicated for the same carb. For instance, on Page 20 there are 3 different metering rods indicated for 95.1AT. But, since we know that the tag on our carb is E4TE-VA we can easily spot which rod our carb takes. However, if we didn't have the tag we wouldn't know which rod is used.